MINNEAPOLIS, Minnesota, December 27, 2013 (ENS) – Researchers are developing a new kind of geothermal power plant that will lock away unwanted carbon dioxide, CO2, underground – and use the greenhouse gas in liquid form as a tool to boost electric power generation 10-fold in geothermal power plants. Teams of researchers at the University of Minnesota, Ohio State University and Lawrence Livermore National Laboratory are collaborating on using CO2 in its liquid form as a supplemental fluid in geothermal power plants. The CO2 would otherwise be emitted to the atmosphere and contribute to climate change. The design contrasts with that of conventional geothermal plants, explained study co-author Jeffrey Bielicki, assistant professor of energy policy in the Department of Civil, Environmental and Geodetic Engineering and the John Glenn School of Public Affairs at Ohio State University. “Typical geothermal power plants tap into hot water that is deep under ground, pull the heat off the hot water, use that heat to generate electricity, and then return the cooler water back to the deep subsurface. Here the water is partly replaced with CO2 or another fluid – or a combination of fluids that extract heat more efficiently than water alone. This approach – using concentric rings that circulate multiple fluids – builds upon the idea to use CO2 originally developed by Martin Saar and others at the University of Minnesota, and can be at least twice as efficient as conventional geothermal approaches, computer simulations show. At relatively low temperatures and pressures CO2 becomes “supercritical,” a phase in which it has the density of a liquid but flows as easily as a gas, resulting in high mobility. The CO2 would be injected into a sedimentary basin filled with impotable salty water and capped by a layer of impermeable rock. 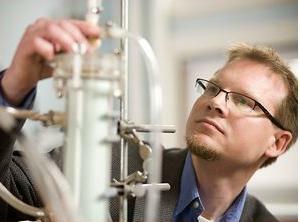 The supercritical CO2 would float on top of the brine and displace it as more CO2 was added. Its high mobility would allow it to rapidly transport the heat it picks up, through the hot geologic formation and up a production well to the surface. There, the release of its heat and pressure would drive a turbine to generate electricity. The cooled and expanded CO2 would then be pumped back into the ground, along with fresh CO2 captured at the fossil fuel power plant, to repeat the cycle. “When we began to develop the idea to use CO2 to produce geothermal energy, we wanted to find a way to make CO2 storage cost-effective while expanding the use of geothermal energy,” said Jimmy Randolph, a postdoctoral researcher in the Department of Earth Sciences at the University of Minnesota, who works with Saar. The technology to implement this design already exists, so the researchers are optimistic that their new approach could expand the use of geothermal energy in the United States far beyond the handful of states that use it now. “We hope that we can expand the reach of geothermal energy in the United States to include most states west of the Mississippi River,” Bielicki said. At the American Geophysical Union meeting on December 13 in San Francisco, the research team debuted an expanded version of the design, along with a computer animated movie that merges advances in science with design and cognitive learning techniques to explain the role that energy technologies can have in addressing climate change. The expanded power plant design resembles a cross between a typical geothermal power plant and the Large Hadron Collider: It features a series of concentric rings of horizontal wells deep underground. Inside those rings, CO2, nitrogen and water circulate separately to draw heat from below ground up to the surface, where the heat can be used to turn turbines and generate electricity. The research team includes Lawrence Livermore National Laboratory, where geoscientist Tom Buscheck originated the idea to add nitrogen to the mix. Buscheck and his colleagues believe that the multifluid design will enable geothermal power plants to store energy away – perhaps as much as hundreds of gigawatt hours – for days or months, so that it is available when the electricity grid needs it. The underground geothermal formation could store hot, pressurized CO2 and nitrogen, and release the heat to the surface power plant when electricity demand is greatest. The plant could also suspend heat extraction from the subsurface during times of low power demand, or when there is already a surplus of renewable power on the grid. 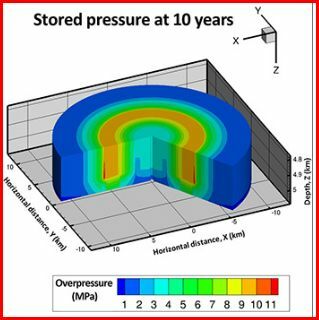 In computer simulations, a 10-mile-wide system of concentric rings of horizontal wells situated about three miles below ground produced as much as half a gigawatt of electrical power – an amount comparable to a medium-sized coal-fired power plant – and 10 times more than the 38 megawatts produced by the average geothermal plant in the United States. Right now, most geothermal power plants are in California and Nevada, where very hot water is relatively close to the surface. But the new design is so much more efficient at both storing energy and extracting heat that Bielicki believes even smaller-scale geothermal hotspots throughout the western United States could generate power. The eastern part of the country is mostly devoid of even small hotspots, so geothermal power would still be limited to a few particularly active areas such as West Virginia, he said. The geothermal plant would probably have to be connected to a large CO2 source, such as a coal-fired power plant that is scrubbing the CO2 from its own emissions. That connection would likely be made by pipeline. Buscheck said the study showed that this design could work effectively with or without CO2, and said a pilot plant based on this design could initially be powered solely by nitrogen injection to prove the economic viability of using CO2. The research team is currently working on more detailed computer model simulations and economic analyses for specific geologic settings in the U.S. The project is unusual in part because, as they were refining their ideas, the engineers joined with Shannon Gilley, then a master of fine arts student at the Minneapolis College of Art and Design. Bielicki worked with Gilley for more than a year to create the computer animated video titled “Geothermal Energy: Enhancing our Future.” Part of Gilley’s task was to communicate the more complex details of climate change, CO2 storage and geothermal energy to the general public. Work at the University of Minnesota and Ohio State has been funded by the National Science Foundation, while work at Lawrence Livermore National Laboratory has been funded by the U.S. Department of Energy’s Office of Energy Efficiency and Renewable Energy. By 2016, Heat Mining Co. LLC, a startup company spun off from the University of Minnesota, expects to have an operational project based on an earlier form of the approach. 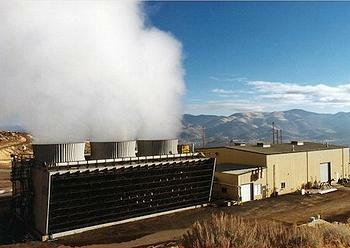 The movie “Geothermal Energy: Enhancing Our Future” is online at: http://www.energypathways.org.